VICTORIA, Canada — A wheelchair user who tried in vain to rescue a neighbour from an apartment blaze was hailed a hero by firefighters who said he probably saved many more lives. Brian Fillman, who was in his mid-60s, died after a fire started in his apartment on the fifth floor of Constance Court on Christmas Eve. But firefighters said the actions of Attila Szabo (pictured), who fought the blaze with two other residents, meant that others escaped. 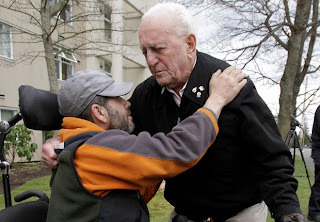 In an emotional scene outside the building Saturday, Fillman’s 88-year-old father, Vern Fillman, hugged Szabo, and paid tribute his bravery. “I want to thank you for trying desperately to save my son,” Fillman told Szabo. It was 6:20 p.m. Friday when Szabo heard the alarm in the building. Szabo, who uses a wheelchair and but has limited use of his legs, ran into the hall and saw a haze of smoke. He found Fillman’s apartment on fire, opened the door and was met with “thick, black, heavy smoke” and flames. Szabo yelled to other residents on the fifth floor to get out. “I wasn’t scared, I stayed calm,” Szabo said outside the building Saturday. He and two other residents broke open the building’s emergency firehose and doused the flames with water. By the time firefighters from Esquimalt, Victoria and Saanich arrived around 6:30 p.m., the flames were out, said Greenhill. Fillman suffered smoke inhalation and was pronounced dead at the scene. Szabo and several other residents were taken to hospital and treated for smoke inhalation. Szabo said even with his limited mobility, he did not think twice about trying to rescue his neighbour and put out the fire. “There’s nothing else I would have gone to do. You remain calm, create a plan in your mind real quick and you hope for the best,” he said. The six-storey apartment building is operated by the Greater Victoria Housing Society. Most of its residents are elderly and many have mobility problems. Raymond Moss, operations manager for the society, said Fillman was sociable. “Everybody liked him. It’s very upsetting for everyone in the building,” Moss said. It appeared the fire started in the living room, Greenhill said. While it was probably accidental, he said fire investigators have not yet determined the cause. Szabo said Fillman was known to light candles in memory of a friend who had recently died. One hundred residents were evacuated and were not allowed to return home because of extensive water damage to the building and its fire alarm system. Emergency Social Services provided took them to shelters and motels to spend the night. By Saturday, about half of the 52 units in the building remained inhabitable. About 40 residents whose units had water damage had to find other accommodation, some staying with family or in hotels. Many returned to the building to collect their belongings or Christmas presents, and stopped to thank Szabo for his actions. It was the first fatal fire in Greater Victoria this year. On Christmas Eve 2008, a woman died of smoke inhalation after an apartment fire on Gorge Road.